Sigrid Blouse and Sirpo Wrap Pullover from Anthropologie. Hello everyone, are some you still trying to find that Thanksgiving outfit. here are some of my holiday picks for the season. 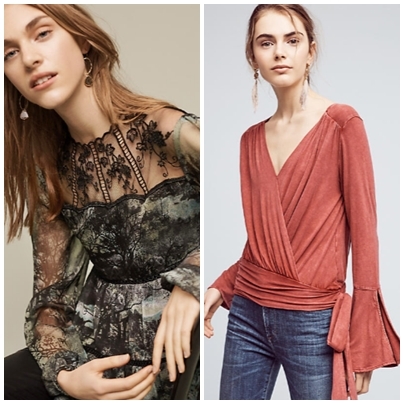 I adore the Sigrid Blouse from Anthropologie that just screams holiday season, it's flattering in any size, when paired with Black leggings or skinny jeans. 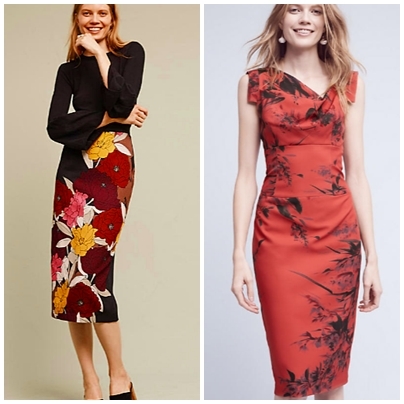 Also from Anthropologie is this gorgeous Berlin midi skirt and printed Jacqui dress is divine. So I hope this post might give you a few more ideas as Thanksgiving draws near. Cheers to the Hols my lovelies. Beautiful outfits. Love the first (lacy) one and the two on bottom - oh who am I kidding - I love them all. I told Alpha Hubby we need to go out so I can have an excuse to purchase a holiday outfit!! "How to dress up to look cute? When focusing on a cute look, accessorizing plays a major role in it. Wearing cute clothes is key to your cute look. Make some place for few items in your wardrobe of cute dresses. Wear skirts in light and bright colors. Skirts or dresses with bow or belt statement over them will come under cute outfits for girls. Pair up your graphic tees with skirts or loose trousers. Take one bold colored graphic tee with a plain light color skirt and if trouser takes dark colors like black, maroon, or burgundy. It can also get included in cute winter outfits but pairing up only with denim and biker jackets. Coming to cute summer outfits, you need to keep shorts with almost everything you wear, whether a tee or a top. Pick shorts in color according to your skin tone and pair them up with cute casual sneakers."